Recently, I posted a kids chair project dedicated to the eternal kid in me. A part of me that lives on despite my quickly advancing age. 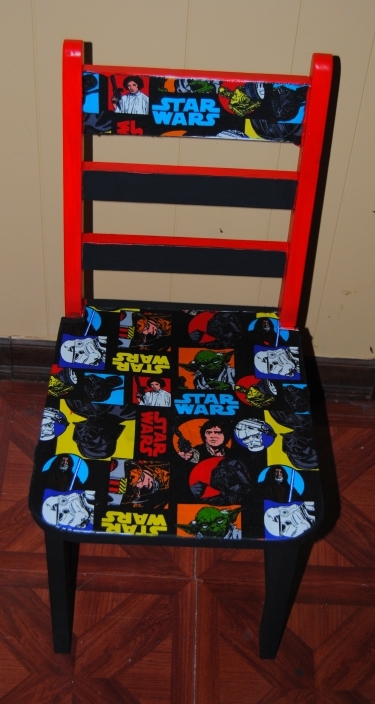 The chair was based on a favorite movie of my husband and I, The George Lucas Sci Fi classic Star Wars. I always wanted to make an item dedicated to the classic movie, but I had no idea of what direction to go in. The thrift store circuit is hit or miss and lately I have been off the mark. To pass the time, I have been browsing around a Joann Fabric store during my lunch break. I tend to stay away because buying fabric in such a setting can get expensive. I like to keep project costs at the very minimum and recycle as much as I can. Even when I chose only to browse I was often inspired by all of the fabric colors and creative possibilities. All the choice and accessibility can be hard to resist! 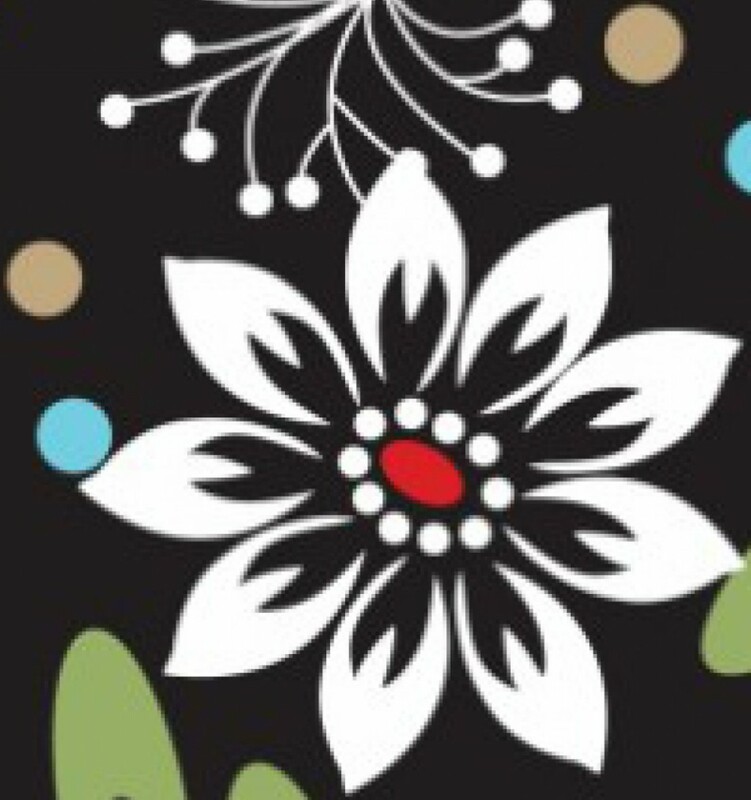 It was to my amazement one day that I stumbled upon character fabric. They have everything from Hello Kitty, Marvel, Family Guy, just to name a few, and best of all they had three different styles dedicated to Star Wars! The fabric was a bit pricey ($14.99 a yard), but as luck would have it, I was able purchase a large”scrap” piece for just under five dollars! I finally had my idea and “Star Wars Kid’s Chair” was born. What to do with the extra fabric? I actually have quite a bit of it left, and I decided to use a smaller piece and make my hubby a Star Wars candle. Then it hit me! With the holiday’s quickly approaching, character candles made with fabric make fun gifts. The best part about the candle is when lit it illuminates the characters and they glow, once again fun for the kid in all of us. I purchased a few glass pillar candles from the dollar store and applied Mod Podge to the outside glass. I trimmed a piece of fabric large enough to wrap the candle, but with minimal over lap. Any seams or overlapping of fabric will be visible once the candle is lit. I applied the fabric to the glass and applied a layer of Mod Podge over it to seal it onto the glass. Allow to dry and it is ready to light! Once the candle is used up, just remove any excess wax and drop a tea light in to illuminate it. 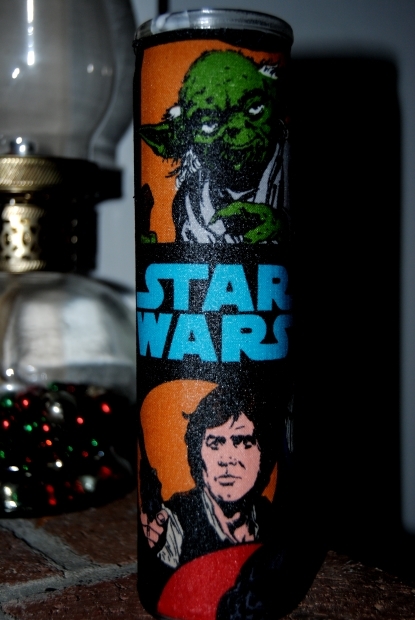 If Star Wars isn’t your thing, no need to worry because with all the character fabric out there, you can make any novelty candle you like! May the force be with you….